After dismantling Royal Challengers Bangalore (RCB), Kolkata Knight Riders (KKR) now travel to Jaipur to face hosts Rajasthan Royals. Having outplayed one Royal, Knight Riders will have their eyes set on another one. KKR are currently placed third on the IPL 2019 points table while Royals are on the seventh spot. Meanwhile, if you are looking for live streaming online of RR vs KKR IPL 2019 match, then scroll below for all the details. Rajasthan Royals vs Kolkata Knight Riders Live Cricket Score. Knight Riders registered an impressive against RCB the other night and now will be looking to continue their winning run. KKR are technically unbeaten thus far. The Dinesh Karthik led side tied their match against Delhi Capitals, apart from it they have won their all other matches. Currently, from four matches, they have won three. Royals, on the other hand, after losing three back to back matches found their first win of the season after defeating RCB. Now having found the first win, Royals will be looking to make it two and climb up on the IPL 2019 points table. RR vs KKR, IPL 2019, Jaipur Weather & Pitch Report: Here's How the Weather Will Behave for Indian Premier League 12's Match Between Rajasthan Royals and Kolkata Knight Riders. The IPL broadcast rights are with Star Sports Network. So, RR vs KKR IPL 2019 match live telecast will be available on Star Sports 1/HD, Star Sports 1 Hindi/HD. Star Sports Select 1/HD will also provide the live telecast of the match. Apart from these, the RR vs KKR match live broadcast will be provided on Star Sports Bangla, Star Sports Kannada, Star Sports Tamil, and Star Sports Telugu TV channels. RR vs KKR, IPL 2019 Match 21, Key Players: Andre Russell to Jos Buttler to Jofra Archer, These Cricketers Are to Watch Out for at Sawai Mansingh Stadium. With Star Sports owning the broadcast rights, the live streaming of Rajasthan Royals vs Kolkata Knight Riders, IPL 2019 match will be available on Hotstar mobile app and official website. 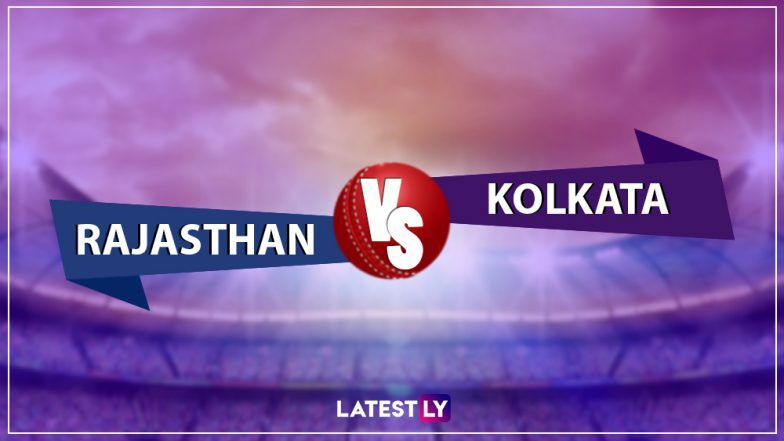 For live score updates RR vs KKR match, fans can follow that here on LatestLY.